The Nine Sovereigns at Windsor for the funeral of King Edward VII, photographed on 20 May 1910.
nine reigning kings, who were photographed together in what very well may be the only photograph of nine reigning kings ever taken. Of the nine sovereigns pictured, four would be deposed and one assassinated. Within five years, Britain and Belgium would be at war with Germany and Bulgaria. Only five of the nine monarchies represented in the photo still exist today. Standing, from left to right: King Haakon VII of Norway, Tsar Ferdinand of the Bulgarians, King Manuel II of Portugal and the Algarve, Kaiser Wilhelm II of Germany and Prussia, King George I of the Hellenes and King Albert I of the Belgians. Seated, from left to right: King Alfonso XIII of Spain, King George V of the United Kingdom and King Frederick VIII of Denmark. There are several family relations in that picture. 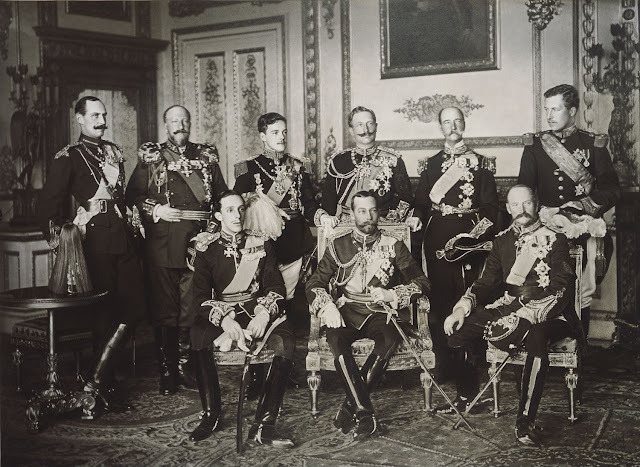 For instance, Frederik VIII of Denmark (bottom right) was the father of Haakon VII of Norway (top left), while Wilhelm II of Germany (top, 3rd from the right) was first cousin of both George V of the United Kingdom (bottom center), and Queen Maud of Norway who was wife to Haakon VII of Norway and sister to George V of the United Kingdom – which made Haakon VII of Norway and George V of the United Kingdom brother-in-laws. George V of the United Kingdom’s and Queen Maud of Norway’s mother was incidentally Alexandra of Denmark, sister to Frederik VIII of Denmark. This means that Frederik VIII of Denmark was also the uncle of George V of the United Kingdom. George was a grandson of Queen Victoria and Prince Albert and the first cousin of Tsar Nicholas II of Russia and Kaiser Wilhelm II of Germany. The funeral of King Edward VII was the last time all of the great European monarchs would meet before the First World War, the same war that would end most of the monarchical lines of Europe for good. Imagine, they all knew a war was coming, all knew it was going to be between them. Looking at this picture really makes one realize how much the First World War was the result of national egos embodied by monarchs. And just how full of nonsense they were with any sense of honor or duty to their states.